If you’re thinking about spending Thanksgiving around a campfire this year, we’ve got some tips to make your outdoor turkey day a success. While most Americans celebrate Thanksgiving by cramming as many extended relatives as they can into a single room, many diehard campers prefer to enjoy Thanksgiving in the expansive space of the great outdoors. We’ll let you judge which scenario sounds crazier. Now, we’ve cooked for large groups while camping before, and it has always been a blast. 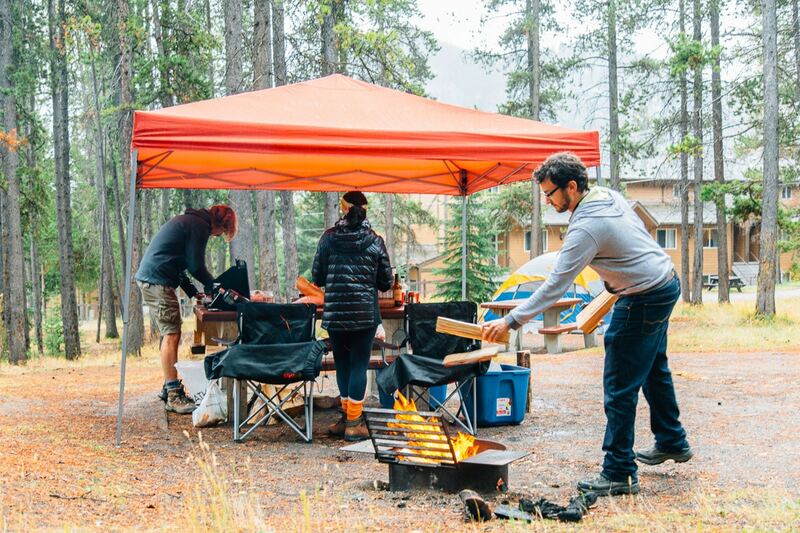 We even celebrated Canadian Thanksgiving last year while camping with friends in Banff National Park in Alberta. But Thanksgiving is no ordinary meal, and there are definitely some logistical challenges that come along with preparing a large group meal… at a campground…in late November. While we’d love to say we developed this list of tips through careful foresight and deliberation, the reality is: most of it come from mistakes we made first hand. So if you’re thinking about bucking tradition (or starting a new tradition) and going camping for Thanksgiving this year, don’t make the same mistakes we did. First and foremost, check the forecast. If there’s even the slightest chance it might rain, you’re going to want to bring a pop canopy or rain tarp. You may even want to bring along a Weber grill to cook on, as rain and campfires don’t make for a good mix . If it’s going to be cold, make sure you have enough firewood to keep the campfire going all day long. Physical discomfort can ruin even the most well-prepared meal. But all that being said, don’t let the weather push you around! Just prepared and you’ll have a great time. 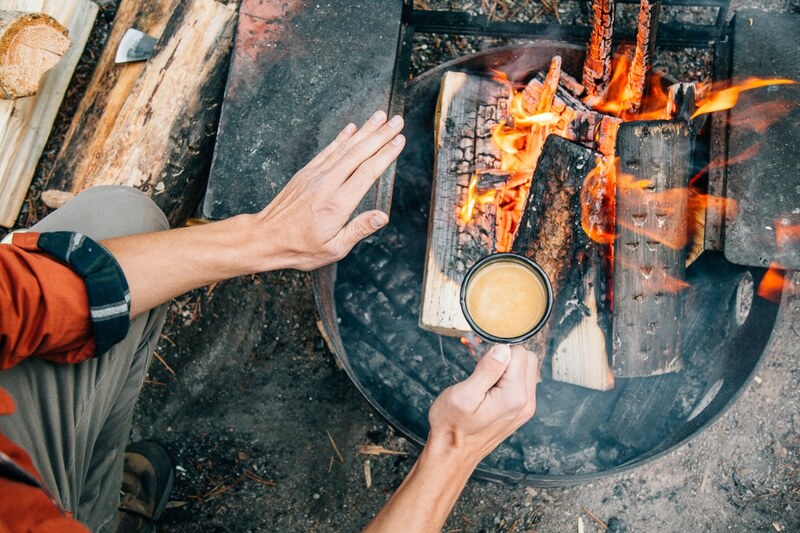 While this might feel like cheating, the more you can do in the comfort of a modern kitchen, the better your overall experience will be at the campsite. Pre-measure supplies and put them in individual zip lock containers. (Don’t like using so much plastic? Pack a few space-saving collapsible tupperware containers or try these resealable biodegradable bags instead.) If you’re marinating anything, get it started the night before. Baking a pumpkin pie? Do it the oven at home and reheat at the campsite. Essentially, anything that can be done in advance, should be done in advance. This was our biggest mistake. While you might want to play the role of host, it’s much better to get people involved. Organizing a potluck style Thanksgiving is a great way to distribute the responsibilities and is well worth a few chain emails to sort out who is bringing what. When you’re at the campsite, be sure to delegate tasks like cutting vegetables, splitting wood, and making cocktails (see tip #6). Wherever you can, encourage crowd participation. People naturally want to help out while camping, so let them be a part of the process! Delegate tasks: While a few people prep the food, someone else can be in charge of keeping up the fire. When you’re outside, everything takes longer than expected. It’s an unfamiliar setting, the equipment is less than ideal, and everything is liable to be misplaced. Plus, now that the clocks have been rolled back, it starts getting darker (and colder) a whole lot faster than you’d expect. So get the fire started early and give yourself plenty of daylight to start cooking. We use an app called “Magic Hour” that shows the time of sunset based on your current location. This works for both indoor and outdoor Thanksgivings. Whether it’s mulled wine, hot apple cider, a hot toddy, or a spiked pumpkin chai, sipping on a warm drink is a great way to get into the holiday spirit. We’d suggest preparing a big pot like a party punch bowl and just let it simmer over the fire. 7. Cooking For Over Four People? Paper Plates! Forget about those enamel camping plates! If you’re cooking for more than four people, paper plates are a must. Cooking for a group can be stressful enough, never mind worrying about the pile of dishes you need to wash in the dark after it’s all said and done. So do yourself a favor, get some nice sturdy paper plates (these are a great Earth-friendly, compostable alternative) and skip the cleanup. This suggestion isn’t for everyone; for some people, the turkey is an absolute requisite. However, for those with an open mind, we would like to put forth this argument: the turkey takes 80% of the time and energy of cooking, but at best takes up just 20% of our plate. So we suggest ditching the bird entirely and double downing on the sides. You’ll get more variety, with less effort. Or you can check out our all in one Thanksgiving Bowl, that features turkey sausage instead of a whole bird. Get that full Thanksgiving flavor with only a fraction of the work. Get the full recipe here. After cooking an entire meal outside, attempting to prepare an elaborate dessert requires an absolutely herculean effort. The best option is to make your dessert ahead of time and just reheat it at the campsite. But if your set of making something on location, we have a few easy to assemble desserts you can try. 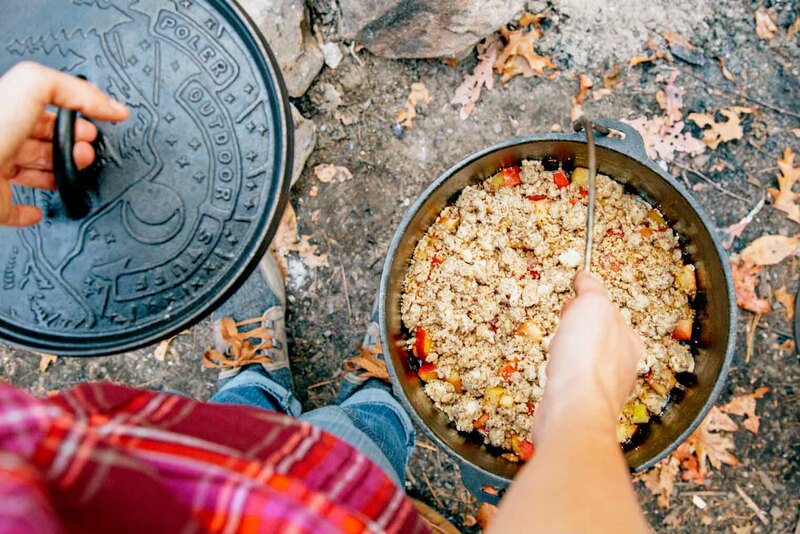 A no-bake crisp is great if you’re using a camp stove, or if you have a Dutch oven and already have a campfire going, you can try this pretty easy, mostly hands-off Dutch Oven Apple Cobbler. 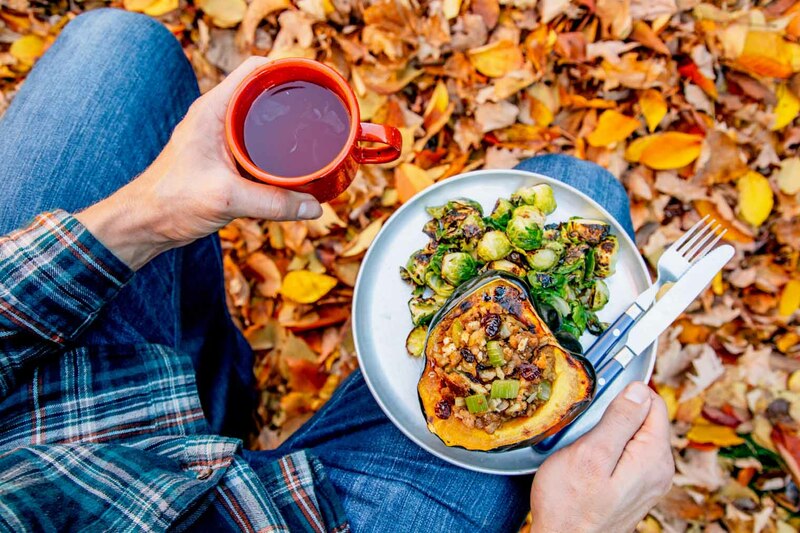 If hosting Thanksgiving at a campground is totally out of the question for your family (which, honestly, is totally understandable) you could also consider hosting an outdoors Friendsgiving. While you can’t choose your family, you can choose your friends – and hopefully those friends like to camp as much as you do. 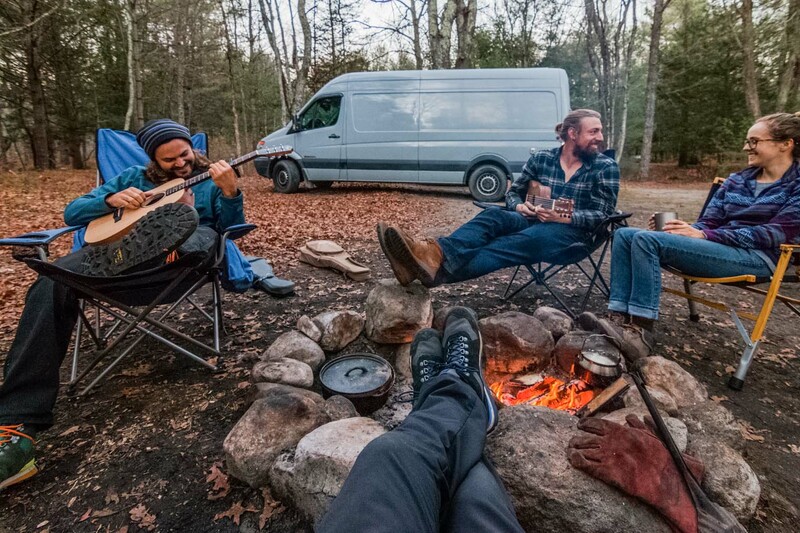 Have you ever celebrated Thanksgiving / Friendsgiving on a camping trip? What tips would you share? Let us know in the comments below! Your links in this post are broken FYI. Dang. Fixing all of them now. So sorry for that! That sounds like a great event, Liz! It’s so nice to be able to spread the food prep among a bunch of different people. I think everyone is a little more relaxed since it all comes together a little easier and it feels sooo much less like a “high stakes” event. Smoked turkey is the best! We had a smoked vs deep-fried turkey cook-off last year, and while the crispy skin of the deep-fried turkey was no contest, the flavor of the smoked turkey couldn’t be beat. Hope you have a wonderful Vansgiving this year! We have used it several times for group camping trips. Give it a go. Every thing you need stores flat in a leaf bag. You can put it below all your normally packed camping equipment . For years we have celebrated Thanksgiving outdoors. I cook turkey in a modified canning pot. After punching holes about an inch from the bottom of the pot, simply layer charcoal on the bottom and place tinfoil wrapped turkey, neck down on top of charcoal. Even a large turkey that protrudes way over the top of the ‘cooker’ will cook. Test with thermometer. Usually take as long as in a traditional oven. Perfect! My girlfriend and I are going to be yurt camping at Ridgway State Park in CO for Thanksgiving! I plan on doing a bunch of sides, some thick sliced already cooked turkey breast, and bootleg-smoking a couple turkey legs. Perfect post! Thanks! Yurt camping sounds like the perfect way to spend Thanksgiving! I bet that smoked turkey will be awesome. Have a great trip! What a special experience for you and your boyfriend! It’s so important to stop and take time to remember what’s important… not the food or the party, but sharing a moment with a loved one, even if it’s a buggy moment! (or cold and rainy in our case) Thanks for sharing! Haven’t been Thanksgiving camping yet but are getting prepared. Last year, we bought a Rocket Roaster and tried it out by cooking about a 12 pound turkey using charcoal and it only took about 2 1/2 hours and it came out great. For our large family, if I can get them to go Thanksgiving camping, we could buy a second roaster and get 2-12 pound birds and be set. That’s awesome! Never heard of the Rocket Roaster, but it sure would be impressive to road a whole turkey over the campfire. Hope you have a great holiday this year!